Wintergreen Resort, located in the heart of Central Virginia’s Blue Ridge Mountains, is a four-season destination featuring skiing, snowboarding and snowtubing, two championship golf courses; an award-winning tennis program, a full-service spa, hiking, fly fishing, horseback riding, swimming and mountain biking. Accommodations are ideal for families, groups of friends, and couples. Options include 230 villa-style condominiums and rental homes –from studio suites to nine-bedroom homes—each offering a fully equipped kitchen and comfortable living area, and most come with fireplaces and a balcony or deck. Location: Wintergreen Resort is located in Nelson County, Virginia off of Rt. 664. It is approximately 160 miles (3 hours) southwest of Washington DC and 45 miles southwest of Charlottesville, Virginia. The resort is situated above the ski trails and boasts spectacular mountain views. Snowsports School – instruction for all ability levels, Discover Skiing & Snowboarding program featuring discounted rates on a multiple visit lesson package. Shamokin Ice, located in the heart of the mountain village, is a 45 x 90 foot rink that accommodates up to 60 skaters. The Copper Mine Bistro - Serves a traditional breakfast in the morning and an innovative Mediterranean menu at dinner with a creative menu of large and small plates and the popular gourmet pizzas. Devils Grill Restaurant and Lounge Clubhouse - Located at the Devils Knob golf course, featuring mountaintop views in an elegant atmosphere. 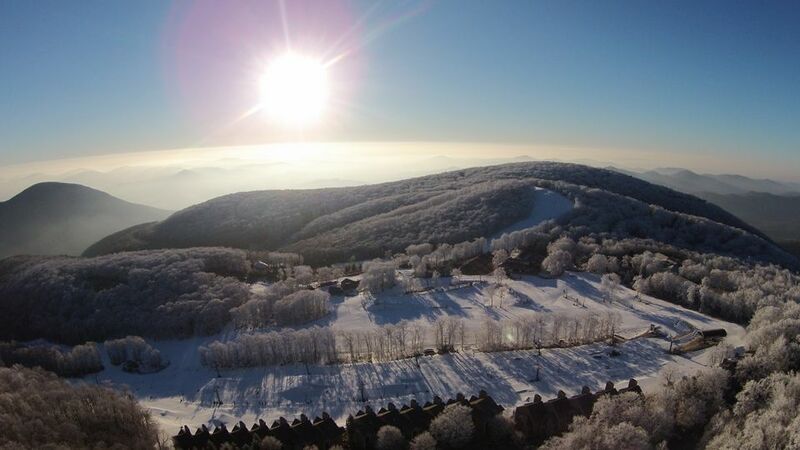 Exclusive access for Wintergreen Resort registered guests, Wintergreen Members and guests of Members. Stoney Creek Bar & Grill - Fantastic views of the Blue Ridge Mountains overlooking the golf course; casual menu and “neighborhood” atmosphere with contemporary American fare. Golf - Wintergreen is home to two championship golf courses: The mountaintop Devils Knob Golf Course is ranked as one of Virginia's best courses with panoramic views and comfortable summer temperatures. In the Rockfish Valley, Stoney Creek Golf Course is a beautiful and challenging course that is open year-round. Swimming, boating, and fishing - Lake Monocan Park, a 20-acre lake and park, is open daily Memorial Day Weekend through Labor Day and weekends in the spring and fall. Amenities include a snack bar, picnic area, boat and bike rentals, fishing equipment, horseshoe pits, sand volleyball court, sandy beach, and lounge chairs. Tennis - Devils Knob & Stoney Creek Tennis Facilities are ranked among the top tennis destinations in the nation. With 19 clay courts and 3 indoor deco-turf courts, Wintergreen offers a prime location to enjoy a tennis getaway. Hiking - There are 30 miles of marked hiking paths (some joining the Appalachian Trail). Guided hikes with a naturalist are offered on Wednesdays and Saturdays. Wintergreen Resort offers a wide range of accommodations. The Mountain Inn features hotel-style suites, located at the mountain village within steps of the restaurants and shopping. The condominiums and private homes are spread out throughout the mountain resort offering privacy and scenic views. The facilities are modern and comfortable. Most visitors make their reservations through the Wintergreen's official resort rental program, however some properties are advertised or rented through private owners or real estate brokers. The Wintergreen Nature Foundation - the Nature Foundation established the hiking trails throughout the resort. They have an extensive selection of trail maps available. There are nature exhibits, children’s activities, educational programs, and naturalist guided programs. Wintergarden Spa - a full-service spa, indoor and outdoor swimming pools, hot tubs, exercise facilities, and fitness classes. Wintergreen Performing Arts - a non-profit organization that produces a summer music festival as well as other performing arts programs throughout the year. Devils Backbone Brewing Company - brewery and full-service restaurant. Wild Wolf Brewing Company - brewery, restaurant, sports bar, and shopping village.